Kevin doesn’t have to wait any longer. Today, CBS announced they’ve given a full season order to the new series Kevin Can Wait. The sitcom stars Kevin James as a newly retired police officer whose plans of relaxation are put on hold when his older daughter and her fiancé move in. The cast also includes Erinn Hayes, Mary-Charles Jones, Taylor Spreitler, Ryan Cartwright, and James DiGiacomo. So far, the comedy has performed well in the ratings. Four episodes in, the show has earned an average of 2.40 in the 18-49 demo and 10 million viewers. 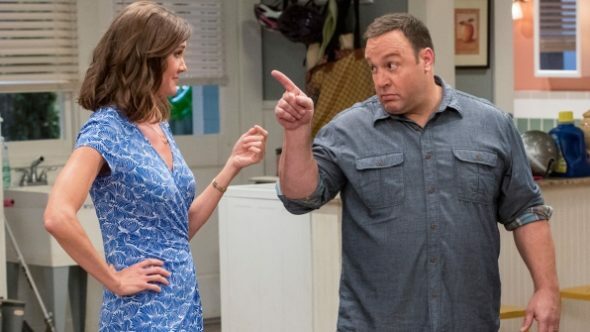 Kevin Can Wait isn’t the only new series to receive a full season order from CBS. Today, the network also extended the episode orders for MacGyver and Bull. What do you think? Have you seen Kevin Can Wait? Are you glad it’s received a full season order? What happened to Kevin Can Wait? Why isn’t it playing on Monday nights? Kevin can wait stay on! Change the wife’s character, she is dry with no depth.